Or Networking Disperate Retro Computers? 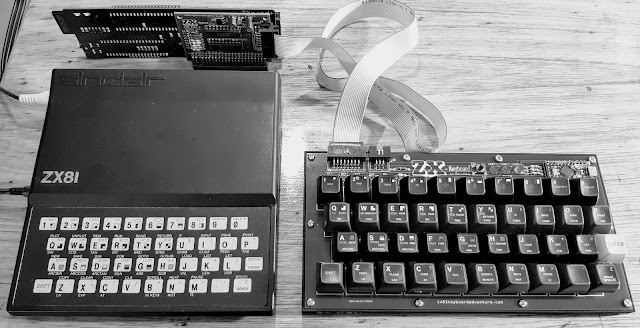 I've been meaning to write something about the ZX81 Ethernet adapter Zeddynet for a while now, but hadn't got around to it for various reasons. In the last week or so another more general purpose retro network device in the form of a Serial to WiFi modem / network adapter, the WiModem232 crossed my threshold rekindling ideas around networking old computers. Now we have the basis for a slightly confused and conjoined blog post, one that ends up being not quite a review, mostly not a tutorial and a slightly random collection of ideas on network hardware and software, in which I get a number of ancient machines on-line connected to a BBS, a BBS that ends up being my own local BBS. Now for a brief look into the networking devices I'm using. Both interfaces are specific to my needs (and small retro collection), the WiModem232 is certainly of much use to the general retro community, where as the Zeddynet is obviously of more limited one machine appeal. 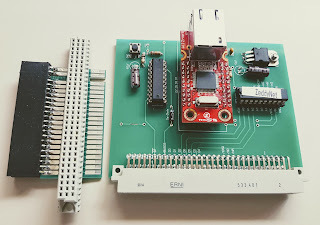 Starting with Zeddynet and the ZX81: The Zeddynet board mounts onto a ZX81XT extender / extension board, and combined plugs into the ZX81s expansion bus. The card is quite tall with the Ethernet port located at the top. This arrangement is a little cumbersome, particularly once a network cable is plugged as the cable and the card tend to get in the way of a low-ish sitting desktop monitor. Still we're about to plug a ZX81 into a network, a few aesthetics issues and minor viewing discomforts are hardly of major issue compared to the achievements realised. 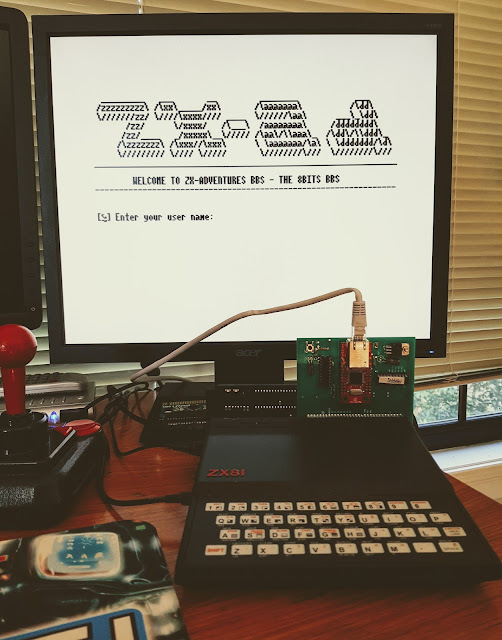 Available sporadically from and designed by the German ZX-Team, Zeddynet as the name implies connects a humble ZX81 to a TCP/IP network via Ethernet cable. Zeddynets first appeared back in 2012, I procured mine mid 2017, unfortunately no more have been produced since then (at the time of writing). 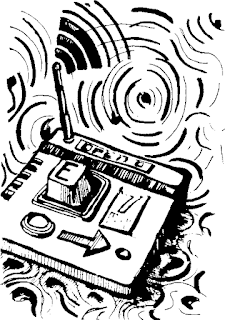 Still, keep an eye out on SinclairWorld forums should you desire a fully assembled Zeddynet. 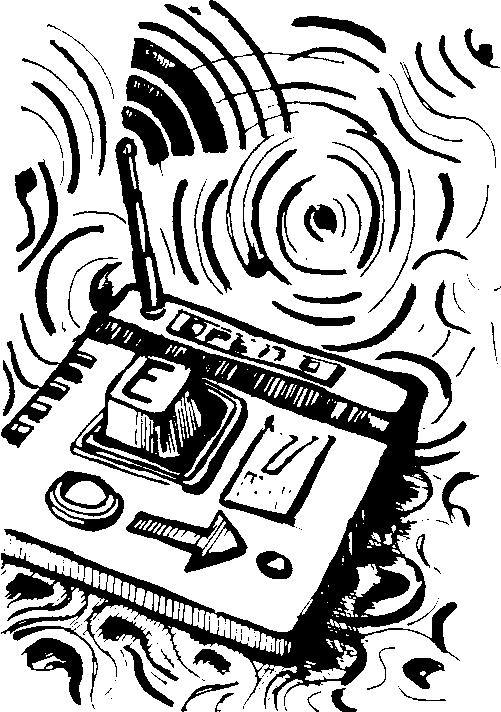 In order to configure and use the Zeddynet expansion on the ZX81 some software is required. 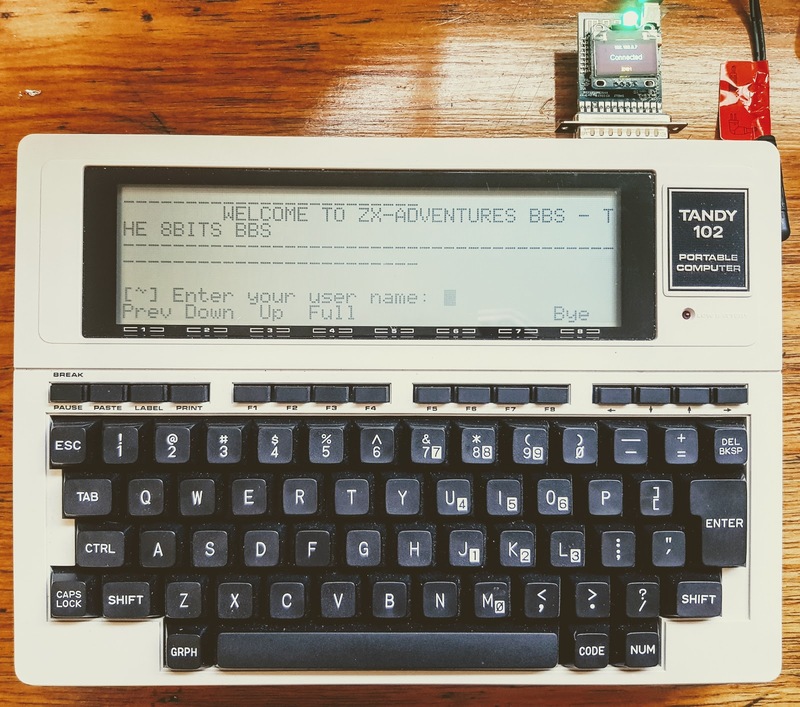 At minimum in order to get a ZX81 connected to online BBSs software in the form of ipconfig and telnet are required. 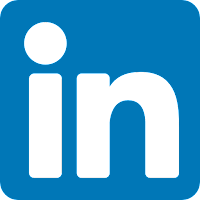 Telneting is only one small part, there are web-browsers and network file managers and more. 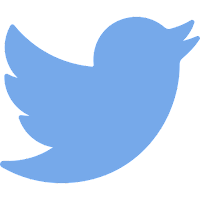 The German Sinclair forum.tlienhard.com has links to all software and sources. Around the middle of 2017 Paul Rickards released the WiFi232 Internet Hayes Modem for retro computers, the perfect solution for networking old computers. Sadly the device has remained sold out for months, and may now be permanently unavailable. 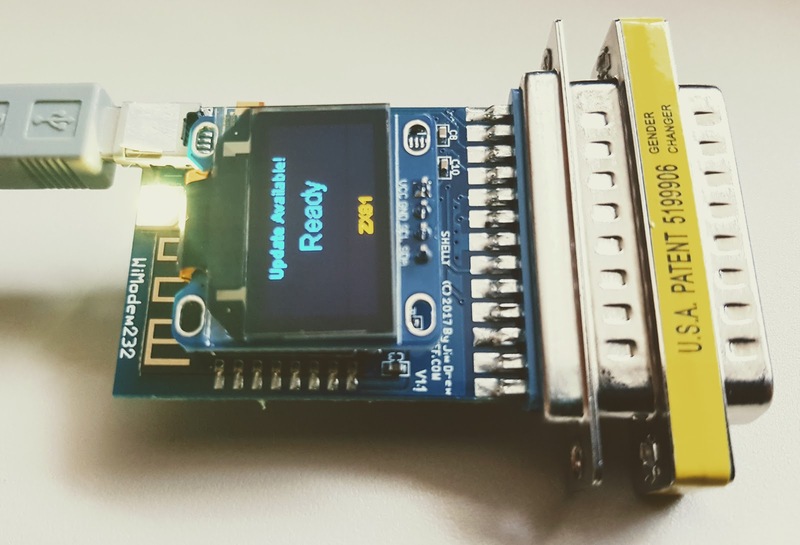 Luckily and possibly inspired by the original WiFi232, two new solutions have recently hit the market from CBMStuff, the WiModem232 and WiModem232 w/OLED. Functionality wise, the only real difference between the WiModem232 and WiModem232 w/OLED is the rather obvious OLED screen. The choice of adapter comes down to a desire for a handy information display or a need for the milliamp power savings brought about by not including it. Note that on both variants an RGB LED provides a status indication allowing you to easily live without the OLED screen. The modem is configured and connected to a WiFi network by Hayes Modem command extensions. Similarly Hayes commands are used to connect to telnet instances on a local network or further a field. In order to use the WiModem232 simple terminal software is required. The machines I've tested the WiModem232 with (TRS-80 model 100/102 and an NEC PC-8401) have terminal software built into their ROMs, in all cases this worked perfectly. Dial up BBSs were a major thing before the Internet age, but sadly faded into slight irrelevance in the late 90s, but now they're back and on the Internet. In fact there is a whole new (old) world out there waiting to be connected. Perhaps the best resource for finding BBSs is the Telnet BBS Guide. 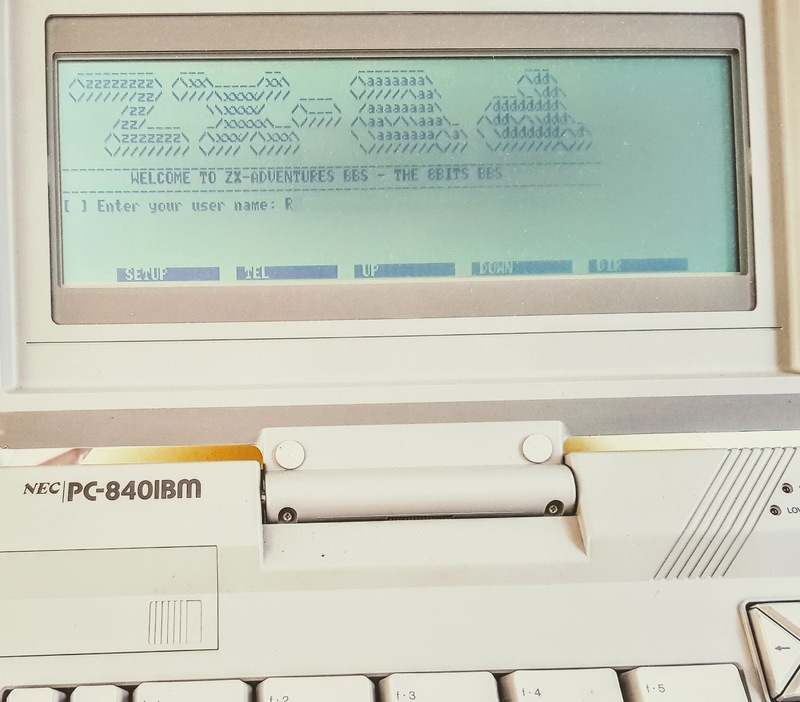 Telneting to any of the BBSs listed from a modern PC is fairly trivial, being able to telnet from a vintage micro computer is (whoo hoo) exciting. Despite the wealth of BBS out there, I wanted to try out Zeddynet and the WiModem232 on my micros' without burdening the various online resources. 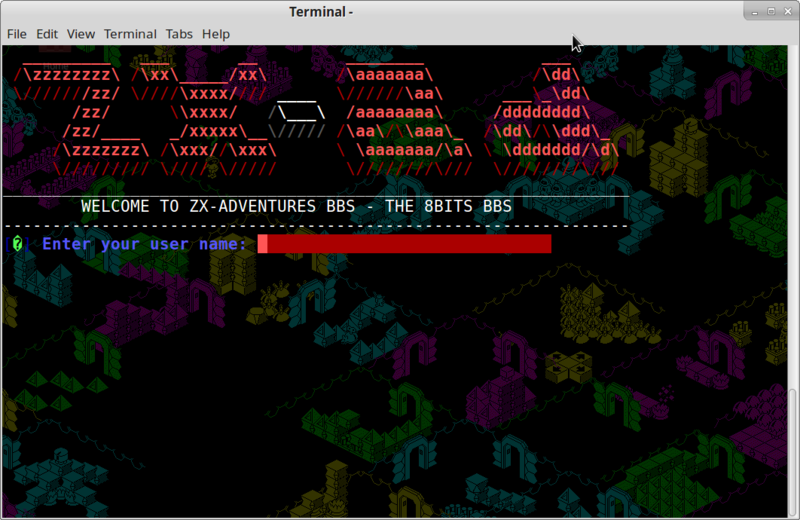 Possibly I'd rather like keep the BBS running, with a view to opening it up for others to log on at some point. For these reasons I decided to to deploy a Raspberry PI and install some BBS software. The Telnet BBS Guide helpfully lists the software being used by various BBSs in it's site registry. Of the software listed 'Mystic' BBS seems by far the most popular and actively maintained kit going, plus it has Raspberry Pi versions available that work on all network enabled Pies. A logical choice then. The setting up 'Mystic' is as easy as unzipping, running a minimal installation, and then starting a BBS server. In less than five minutes you can have a bare bones BBS up and running and telnet-able into. After that 'your mission, should you choose to except it', exposes a whole rabbit hole of configurations and text files to modify in order to tailor and craft a unique BBS experience. In its default state Mystic targets computers with 80 columns and full ASCII / ANSI support. This is great for Amigas, Atari STs and IBM clones, not so great for 8 bits micros. This situation is fixable, but it does require a full redesign of the built in theme. The task is not difficult, it does though require some dedication. All BBS layout files can be altered with tools built into Mystic, thus allowing for complete customisation of a BBSs look and feel. 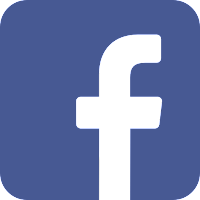 It is even possible to create ASCII and ANSI versions of pages servicing general fallback requirements. As a general design rule in targeting older 8bit machines I found it wise to limit charter selection to the first 128 ASCII characters. Using above this limit you start running into compatibility issues between the various proprietary character sets employed by 80s micros. I'm going out on a limb here and suggesting that period telnet / dial up software should automatically transpose any basic character set incompatibilities if working within the 128 limitation. There is a long way to go and to start I've only scratched the service of setting up a BBS and using the Zeddynet and the WiModem232 interfaces. On the BBS side of things my only real attempt at customisation has been the Welcome Screens. For now though it serves as a proof of usability both software and hardware. 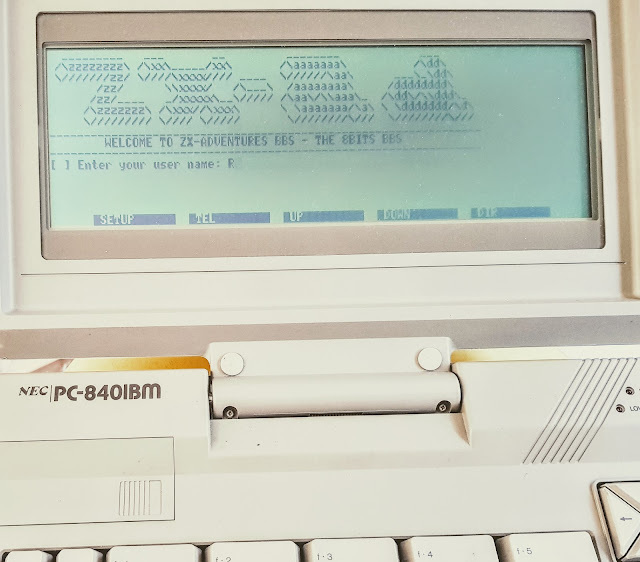 Limiting the choice of characters, but allowing for ANSI colours, a LINUX logon to the ZX-AD BBS (as I've named it) looks plain as opposed to what is possible for a full ANSI/ASCII experience. 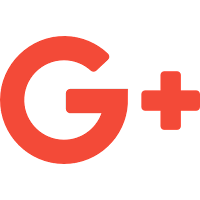 It does help provide a similar experience across all platforms however. I limited the welcome screens width to 64 characters, this fits nicely with ZX81 hires modes (additional hardware required). 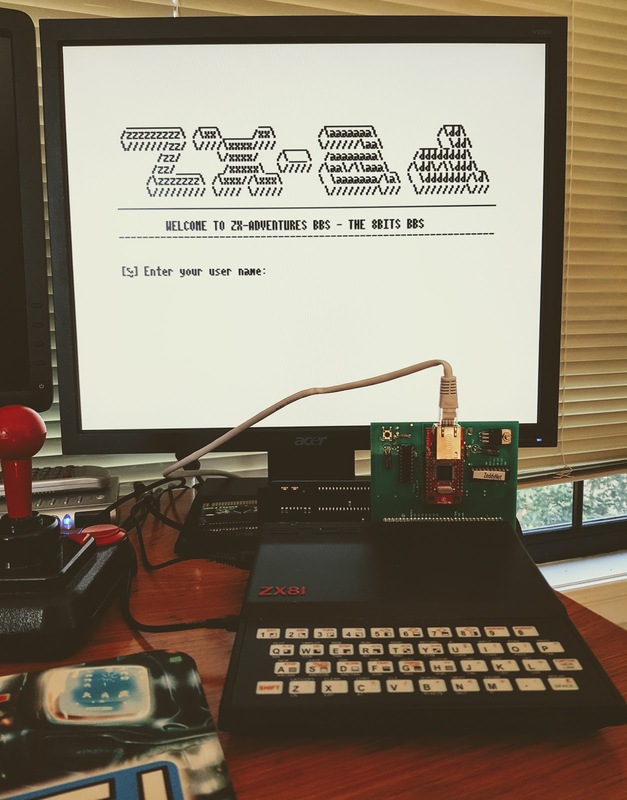 I'd also created a ANSI and ASCII versions of the welcome screen the ZX81 is using the ASCII variant. The Tandy machines are limted to 40 character width screens. Mystic can support this, but I haven't tailored the welcome screen to the 40 character limit, and the screen therefor doubles around. Using the Tandy machines I found that the WiModem232 baud rate could also be no higher than 1200 else I started experiencing character loss. Mystic attempts to verify if a connecting computer supports the ANSI standard, interestingly the NEC-PC8401 reports back that it does. This is of course a lie, as it does not. Regardless of this untruth it will render the display correctly if the first 128 ASCII characters limit is adhered to. Also as fully functional CP/M computer the PC8401 has a 80 column display, consequently there is no issue with screen width, screen length however may pose its own problems latter. Thus ends a rather scattered post on networking 8bit machines and BBS software. On the hardware side of things I can uttery recommend the WiModem232, it really is very simple to use. Zeddynet is similarly fun in execution. In both cases the full possibilities have hardly been touched on by this post. As for the running a BBS, it's entirely likely I'll refine and open my local experience up to the broader world. Coming Soon - ZX-AD BBS.